Our Librarian’s selection of books to adopt. Once you have chosen your book, print and complete the application form below, and enclose your donation. Mary Astell (1666-1731) is frequently referred to as the first English feminist. A Serious Proposal was her first published work and argued in support of the education of women. 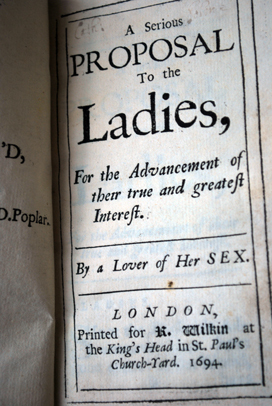 It proved to be an influential work, running to a further four editions by 1701, and provoking much debate and published response on the subject of women’s right to be educated. When Jane Austen embarked on her fifth novel, Emma, she is said to have said "I am going to take a heroine whom no one but myself will much like." She could not have been more wrong. Emma was published just after Jane Austen's fortieth birthday, in December 1815, and was the last of her works to be published in her lifetime. First published in 1813, and Austen's most popular novel in her own lifetime, Pride and Prejudice has since been widely recognised as one of the finest novels in the English language. This edition features the famous peacock illustration on the front cover by Hugh Thomson. When her husband’s attempt to set himself up as a printer failed, Elizabeth Blackwell determined to raise funds to release him from prison by drawing and engraving for a new herbal book, a huge undertaking that took several years. She taught herself engraving in order to do this, and hand-coloured each design. The results were initially issued in weekly instalments; the two completed volumes sold for the very considerable sum of £5. When Self-control appeared in the spring of 1811, six months before Austen's Sense and Sensibility, it was Brunton's first novel that was the sensation of the year, an overnight bestseller, and not Austen's. A religious tale written by a self-doubting Presbyterian, our copy is the one that belonged to Jane Austen's brother, Edward, and was read by Jane herself. The reputation of Frances Burney was largely established with her first novel, Evelina. Published anonymously in 1778, it is an epistolary account of a sheltered, orphaned young woman's entrance into society, and of her experience of family. Its comedy ranges from violet practical joking reminiscent of Smollett's fiction to witty repartee that would influence Austen. Elizabeth Carter (1717-1806) first made her name in 1758 with her English translation of the work of the Greek philosopher Epictetus, for which she was acclaimed by Samuel Johnson as the ‘best Greek scholar in England’. Carter also published numerous essays, articles, and translations and was an influential member of the Blue Stockings Society. Elizabeth Montagu (1718-1800) - known as 'Queen of the Blue Stockings' for her involvement in organising and hosting literary salons - was a celebrated Patron of the Arts and Literature. She wrote the important An Essay on the Writings and Genius of Shakespeare (1769) and was the author of many letters to leading figures of her age. Her letters were not published until after her death. Mary Robinson was an actress, poet, dramatist, novelist and celebrity figure, and the subscribers' list to this collection of poetry featured many royal subscribers, along with Sir Joshua Reynolds and R.B. Sheridan. This copy is bound and inscribed with the personal insignia of Victorian writer Violet Fane, pseudonym of Mary, Baroness Currie. Maria Rundell’s cookery books sold many thousands of copies in the nineteenth century. Chawton House holds a copy of A New System of Domestic Cookery and this one: The new family receipt-book, containing eight hundred truly valuable receipts in various branches of domestic economy selected from the works of British and foreign writers of unquestionable experience and authority, and from the attested communications of scientific friends.